Do Not Feed or Molest | SpeakUp! What would you do if you were face-to-face with a real alligator? Take a moment or two; after all, it’s not every day you’re confronted with a question like this. If you can read the sign in the photograph above, it indicates that Florida Law prohibits feeding or molesting alligators. Not sure I know anyone who would actually want to molest a gator. I’m thinking you’d run in the opposite direction faster than an egg beater on turbo-power. Am I correct? We know alligators are notorious for their bone crushing bites. And an ‘average’ alligator weighs in at 800 pounds and about 13 feet. Although the record in Florida is said to have been 17 feet 5 inches long. Yikes … Oh yeah, and alligators have on average about 75 teeth and live approximately 50 years. So I interpret this to mean that if you come across a gator, especially an old(er) gator then you could be dealing with a frustrated old geyser, so run like hell. After living in Florida for 22 years, I’ve seen my share of gators, although never quite face-to-face. However, the sign above stands prominently in the Florida Botanical Gardens in Largo, Florida. London friends were visiting and my husband and I brought these friends to various local parks to see the sights. Do we WOW ‘em or what? Only the best for our friends we say. 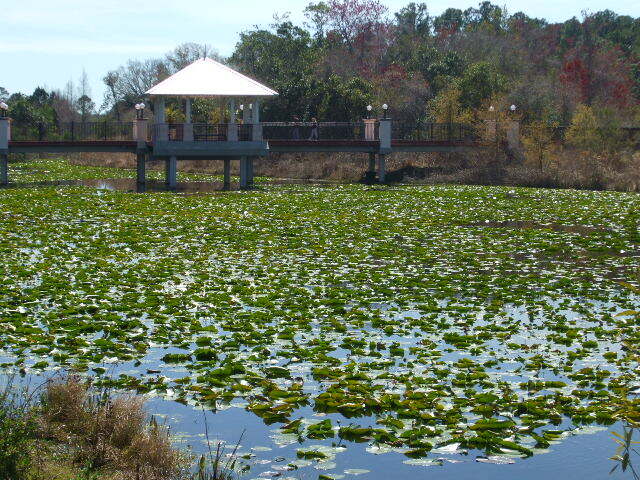 I assure you that this park is lovely with lily pads, boardwalks, and trees, plants, flowering bushes everywhere. 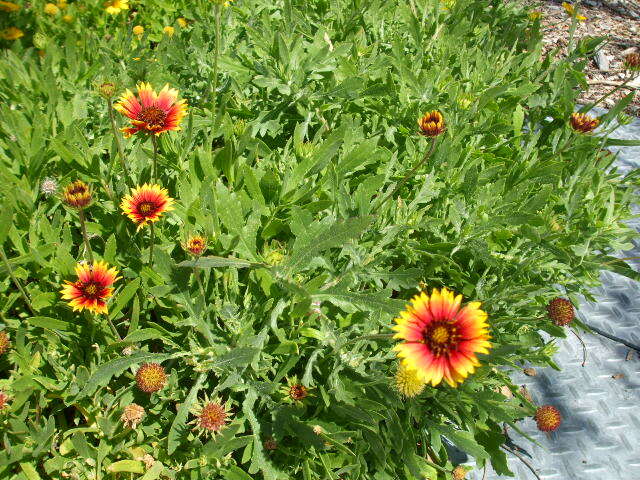 Well, we have had a very hard cold winter for Florida and there’s quite a bit of brown leaves and dead tree limbs and shrubs and plants. Obviously alligators are in the water at the park. And dutifully, park management decided to alert the public in this manner. But, twisted mind that I have at times, I started thinking about this reference to humankind vs the animals, specifically gators. 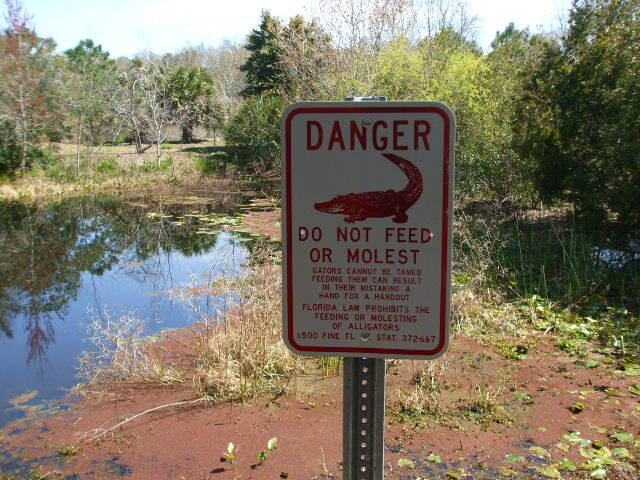 It seems to me we need to notify the gators to not molest the humans and no feeding upon us. Alright now, I know some of you are aghast amidst the chuckles. Though you realize this is true, right?